I must be getting old. Large, outdoor concerts are just a drag. Despite the fact that we had great seats (16th row front & center), all I could think about was how they crowded us into the seats like sheep. Maybe 12 inches between seats. Chastain Ampitheatre allows you to bring in coolers, which only makes the overcrowding worse. Well, if I'm gonna drink at a concert its gonna me my hootch, not some overpriced, pint-size drinks at the bar. But, to be fair, once the music started I forgot about the crowding (well, there were a few times, like if anyone needed to leave their seat!) Back to the music. Paul Simon and Bob Dylan are about as different as night and day. The ONLY thing they have in common is that they both found their first popularity in the 60's. Paul Simon started this show just after 7pm, as people were still filing in. The stage was full, a total of twelve musicians. He started with a re-make of "Bridge Over Troubled Water". Most of Paul's set consisted of his later-day material, such as "Diamonds On the Soles of Her Shoes", "Late In the Evening" and "You Can Call Me Al". By the time he played, "Me and Julio Down by the Schoolyard", he had everybody on their feet. Another highlight was "Still Crazy After All These Years", played faithfully to its original version. Although I enjoyed his show, I wish he would have played more of his earlier works. At the end of his set, Paul introduced Bob Dylan, who entered wearing a western-style black suit. This in contrast to Simon's jeans and t-shirt. They started their duo with "That'll Be the Day", the Buddy Holly Classic (which is kinda ironic since legend has it that Dylan was at Holly's very last concert before the fatal plane crash). They continued with "the Boxer" and "Knocking On Heaven'sDoor". 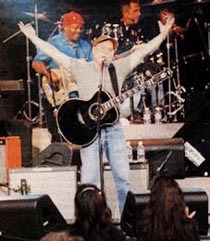 After a short break, Dylan re-entered the stage with his band. Quite a contrast to Simon. Six musicians, including Dylan. Plus,a stand-up bass in place of an electric bass. Although I couldn't hear most of his lyrics (but hey, this is Bob Dylan I'm talking about), I did like his new interpretations of his classic songs. I was surprised by the amount of guitar leads that he handled himself! Some of my personal highlights were his renditions of "It's All Over Now Baby Blue" and " Tangled Up In Blue" (complete with Dylan guitar solos instead of the classic harmonica-he finally DID play harmonica at the end of the song). Although I'm no Dylan fanatic, I was finally glad I got to see this legend in concert. And since he has been touring straight for the last ten years, I'll probably have plenty more chances to see his "new" interpretations of his classics.